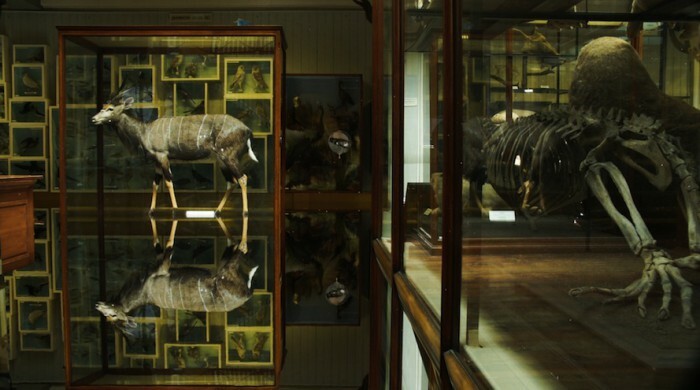 I am sitting on a bench, gazing at the displays in Dublin’s Natural History Museum – the soft hide of an antelope, a series of small skulls, a pair of taxidermy owls, glass eyes behind glass. The spectacle of this museum, so familiar in childhood, feels somehow cosy still. Despite the fact that everything here is allusive of death, of extinction, to view these displays remains comforting. But the almost nostalgic tranquility of the scene is distorted, because I am not, in fact, sitting in the Natural History Museum. I am peering at this scene from a great distance, from an art gallery many miles away, and as I look, I am slowly realising that this museum has filled with water. I begin to understand that I am watching the aftermath of a catastrophic disaster. Despite the implication of a recent cataclysm, the scene itself is somehow peaceful; the water here lulls us, as it always does. The Glucksman Gallery lifts itself high into the treetops over Cork City, a warren of narrow rooms and bright galleries holding works of sculpture, photography, of neon tubing and paint, of torn fabric and spit. The exhibition that I have come to see was held in early summer, when the branches outside were filled with leaves. Curated by Glucksman director Fiona Kearney and titled 2116, it was an exploration of the vision of sixteen artists (Amanda Coogan, Maud Cotter, Gary Coyle, Eleanor Duffin, Damien Flood, Siobhán Hapaska, Ramon Kassam, Sam Keogh, Ruth Lyons, Eoin McHugh, Ailbhe Ní Bhriain, Mairead O’hEocha, Niamh O’Malley, Darn Thorn, Lee Welch, and the Centre for Genomic Gastronomy) as to how they imagine the world will look one hundred years from now. The exhibition seemed, in some ways, a weather forecast. I wandered from room to room, captivated from the first by Eoin McHugh’s mosaic tapestries in carpeting, textured like a map and reminiscent, somehow of digital overwhelm. I smiled at the witty bottles and packages of various ‘future foods’ designed by The Centre for Genomic Gastronomy. Walking up the stairs, I began to imagine what form my own vision of 2116 might take. For a long time, I constructed a mute button in my mind. Every time I read an article about climate change, I would activate this inner button, shielding myself from a sense of impending doom. As time went on, though, this button began to wear thin under the force of mounting, un-ignorable evidence until I came to wonder if we are a people living in the last centuries of a slow, self-inflicted apocalypse. Strange, to feel haunted by something that is yet to happen, but I do. The internet being the primary source of my increasing anxiety about climate change, it was there that I sought out writing that might help to soothe the wound it had inflicted. I found some solace in Zadie Smith’s ‘Elegy for a Country’s Seasons,’ both a requiem for our old ways and an imagining of our grandchildren’s exasperation at our inept dithering. I longed to read more work that might somehow contain my worries, for literature that might function as a balm. Many writers have written through their own manifestations of apocalypse, my personal favourites being the raging, raving Irish bards of the seventeenth century who documented the annihilation of their culture as it disintegrated around them. Their horror is still palpable in their lines, as is their fury. To read their work is to engage in an eerie sort of time travel. I stacked their books by my bedside again and returned to their lines. In doing so, I felt myself knock at their doors again, to sit by their hearths and let the flames they kindled with their words warm my palms. This was a mistake. These are not the men to turn to when in need of hope. I was foolish to summon these old bards to my lamp-lit bedside in expectation of lullabies. Instead, they stoked their fires to a blaze and growled Yes, your nightmare is real! Worse is to come! I couldn’t bring myself to heed their threats. I threw their books to the floor, buried my head in the pillow and tried to sleep. I longed for a book which could return me to my lazy, warm complacence, which could reconstruct my mute button. I wanted my innocence back. Or perhaps my desire was more dangerous, because what I really wanted back was not my innocence, but my ignorance. Like a small child waking from a nightmare, I found myself fretful, craving reassurance, but all of the works from which I sought solace just grimaced and withheld the hope that I so desperately craved. In the end, a sense of epiphany reached me in the most unexpected way, where I sat on the second floor of the Glucksman Gallery, looking into a flooded Dead Zoo. Ailbhe Ní Bhriain’s video installation, with its Kafkaesque title ‘Reports to an Academy,’ entranced me, drew me back to it again and again, to sit and stare. In its expression of my worst fears, it confirmed my anxieties and acted as a poultice, drawing out the poison of my fears. ‘Reports to an Academy’ was initially conceived as a four-screen installation, of which two were displayed in 2116. On one screen, a jagged-edged stone wall, on the Aran Islands perhaps, a familiar structure lifted and built from the landscape, grey, stoic. The wall doesn’t sit on the surface we expect; below the rock, there is no grass, no dirt, no bog. Instead, this wall appears to stand in water. Lush, the ripple of liquid that catches the eye. Lush, it lulls us into itself, as water always does. The animals that it once restrained are gone, and long gone, too, are the hands that built it. I thought of the old seanfhocal, ‘Maireann an craobh ar an bhfál, ach ní mhaireann an lámh do chuir’ (‘The tree that springs from the fence still lives, though the hand that planted it does not’). In Ní Bhriain’s version of our future world, we are presented with this vision of human legacy, a simple stone wall that still stands, only now it stands in water. An owl appears, its head tilting quizzically. Wordless, it demands an answer from us. Or maybe it only questions us. What happened here? What have you done to deserve this? What have you done? Ní Bhriain’s second video yields an answer of sorts. We are in the Natural History Museum now, where all seems well, until we notice the water again. Here, too, there is no discernible human presence. Only water moves through these rooms, watched by plentiful relics of other slaughter and human-driven extinctions. Ní Bhriain’s work is astute, deeply considered and intelligent, with layers of clues that recur between the screens like rhymes. A sudden flicker in the upper corner of the screen, over containers of stuffed animals, and we wonder whether — was that? Could that have been another live bird? Why would it lurk here, among its stuffed cousins? Is it questioning us, tilting its head at us again? No human life is visible here. Only artefacts of our destruction remain, and a strange orb that hovers, reminiscent of the dot that floats under a question mark. Do all things come to an end? No, they go on forever. The world itself will not come to an end, I realise, it is simply that humans will become extinct. We will be just another annihilated species, with no one to blame but ourselves. We will become The Obliterated. Lush, the ripple of liquid that catches the eye. Lush, it lulls us into itself, as water always does. Night will fall for us, and it will be followed by a new day we will not see. Even through the night, when we cannot imagine what the dawn will bring, we will sing. We will make music. We will write. We will create art. We will sing. Listen. The night fills with our voices. We sing and sing. Doireann Ní Ghríofa is a bilingual writer working both in Irish and English. She frequently participates in cross-disciplinary collaborations, fusing poetry with film, dance, music, and visual art. Awards for her writing include the Michael Hartnett Poetry Prize, the Ireland Chair of Poetry bursary, and a Wigtown Award for Gaelic poetry (Scotland)​. Her third book Clasp was shortlisted for the Irish Times Poetry Award 2016. Two poems of Doireann’s, ‘mi.as.ma’ and ‘Cloud/Onset of Early Psychosis,’ were published in gorse no. 5.